“Robert (3rd named Robert de Lacy) ,the son of the first Henry, (who was) brother of Illbert ll. (Robert 3rd. was thus nephew of Ilbert to whom his father Henry succeeded his older brother who predeceased without issue him circa 1141 and of Ralph the Red who was half brother of his father and Ilbert ll ) had no issue by Isabella, so that on his death on 21 August 1193, the first Lacy line came to an end. He left no heirs, and, as there were no other surviving heirs of either Henry or Ilbert II (his father and Uncle) , the succession devolved on the great-grandson of Henry’s sister Aubrey. (It was her daughter Alberta de Lisours, the daughter of the first Alberta, who was the only daughter of the first Robert de Lacy and sister of his eldest son Ilbert (2nd. ), and Henry (1st). The first Alberta was a half sister of the illegitimate Ralph the Red. It was thus the the granddaughter of Robert de Lacy also named Aubrey [after her Mother] that determined that her grandson Roger would inherit the de Lacy lands; got all that ? ), Roger ‘Helle’, constable of Chester, who took the name Lacy, when he was allowed to inherit the lands. He had to pay a relief of three thousand marks, three times the amount that Robert had paid sixteen years before. Thus the honours of Halton and Widnes became joined to those of Pontefract and Clitheroe built up by the first Lacy line, the whole forming the basis of the power of the earls of Lincoln in the next century”.– The Lacy Family in England and Normandy, W E Wightman, p 260. Roger de Lacy (1170–1211), 7th Lord of Bowland, 6th Baron of Pontefract, 7th Baron of Halton, was the son of John Fitz Richard and the great grandson of Albreda de Lacy. He adopted surname de Lacy. In addition to inheriting his grandmother’s ( the 2nd. Albreda noted above) vast holdings, Robert also inherited his father’s titles of hereditary Constable of Chester and the Barony of Halton. Sir John de Lacy, Earl of Lincoln, Surety of Magna Carta (1192 – July 22, 1240), the 1st Earl of Lincoln, of the fifth creation. He was the eldest son and heir of Roger de Lacy and his wife, Maud or Matilda de Clereson. Roger, became Earl of Lincoln and 8th Baron of Halton. He and his cousin Robert de Vere, Earl of Oxford, signed Magna Carta. John de Lacy was buried in Stanlow Abbey. Edmund de Lacy, 2nd Earl of Lincoln was the son of John de Lacy, Earl of Lincoln and Margaret de Quincey. He was born in 1230. He married Alasia di Saluzzo, daughter of unknown di Saluzzo, in 1247. He died in 1258. He gained the title of 2nd Earl of Lincoln in 1232 and was succeeded by his son Henry de Lacy as the 3rd. Earl of Lincoln. Henry de Lacy (2), third Earl of Lincoln1249 to his death Feb. 1310 succeeded his father at the age of eight. He married (firstly) Margaret, daughter and co-heir of William Longspee. He became chief councilor to Edward I. While the king was engaged in military conflicts with the Scots, Henry was appointed Lord Protector of the Realm as regent to Edwards son Edward ll who was not of age (if not of dubious capability). As the third Earl of Lincoln he played a conspicuous part in the history of those times under Edward I according to author Wrightman. He was the chief councilor to Edward I on many foreign and domestic issues including marriages. Even his only daughters betrothed to Edwards nephew Thomas Plantagenet. It was Henry who accompanied Edward Ist. against William Wallace and was his field commander. When Edward l (aka.”Long shanks”) was other wise subduing the Scots, Edward l had such confidence in Henry de Lacy he made him regent to his son. As such he admonished his son (the first Prince of Wales) that he was to “listen to Henry” during his absences. More directly Henry de Lacy was lord of the Honour of Pontefract for fifty-two years and was the de Mittons last paramount feudal Lord of Bowland that included the Mitton manors. The above plaque is at St. Paul’s in London commemorating those who were buried at the old St. Paul’s Cathedral that burned down in the London fire of 1666. The inscription identify s Henry de Lacy 1311 as “Earl of Lincoln and Lord Protector”, meaning he was regent to the first Prince of Wales, Edward ll. Henry de Lacy restated his namesake the first Henry de Lacy (calling him his “ancestor”) grant to the burgesses of Clitheroe. The right to a *market town which cleared the way for greater economic trade in the Clitheroe area. The de Lacy’s had made their barony`s administrative center. This was the Henry de Lacy that built Whalley Abby in 1296 near the de Mitton manor. It was the abbots of Whalley Abby that recorded the early Norman de Mittons in that immediate area. Those genealogies are found in the Coucher Book of Whalley. Henry had two son and two daughters: Edman, born in 1271, drowned in a well in Denbigh Castle; John, died at Pontefract Castle during his fathers`s lifetime; Alice, wife of Sir Thomas of Lancaster; Margaret, died in childhood. *This is a typical market cross that would be granted by a superior Lord (such as the de Lacy’s did for Clitheroe) to allow a town to conduct business. Two people would meet,step up on the base and shake hands in front of witnesses under a market cross which was sanctioned by the crown or dominate lord.The contract would then be binding and was used as such for century’s during medieval times. The de Lacy and de Mittons “peripeteia”. Peripeteia- a Greek term meaning reversal of fortune. Henry’s death Feb. 5, in 1311 coincides with the de Mittons disenfranchised from their de Mitton manor holding. Upon Henry’s death the de Lacy barony passed to Thomas Plantagenet, husband of Ann de Lacy from the lack of a surviving male heir to Henry. The barony thus then went to his daughter Ann whom he had betrothed to Thomas Plantagenet, the nephew of Edward the first when she was nine years old before her two brothers early tragic deaths. The previous year 1310 Edward lll, grandson of the first Edward is born who is regarded as one of England greatest Kings. Unfortunately his father Edward ll was not so successful having lost to Robert the Bruce at the battle of Bannockburg. No matter the de Mittons were no longer lords of de Mitton manor prior to that battle. The succession of the de Lacy barony after the death of Henry de Lacy, 3rd Earl of Lincoln ended the de Mittons as lords of Mitton manor after 1311. They were replaced by Thomas Plantagenet’s own feudal lords of the Mitton manor. Thus the Greek word; “peripeteia” meaning reversal of fortunes best describes the circumstances for both families. Henry was the last most prominent descendant of the great Norman de Lacy’s since Ilbert de Lacy of the 1066 conquest and builder of Pontefract Castle. Henry was descendant from the second de Lacy line from which the title and lands of the Earl of Lincoln came from beginning with Roger de Lacy in 1193. Henry de Lacy died Feb. 5, 1310, and was buried in the old St. Paul’s, London. After the fire of 1666 he and others were buried in another location. St. Paul’s above is where the plaque denoting his burial is located above. Of his two sons and two daughters only one daughter Alice survived him. The two sons of Henry, Edmund and John had both predeceased him early on. It is thought that Edmund drowned in the well at Denbigh Castle and John fell from a turret at Pontefract (or from a window at Ightenhill Manor). In 1294 his heiress and only remaining child, his daughter Alice, was married to Thomas, Earl of Lancaster. She had been contracted in marriage (when only nine years old) to Thomas Plantagenet then Earl of Leicester, elder son of Edmund, Earl of Lancaster, (brother of Edward I., and younger son of Henry III). Pontefract Castle built by Ilbert de Lacy of the conquest and the ancient seat of the de Lacy barony. Thomas Plantagenet Earl of Lancaster, was executed in 1322 by Edward 2nd. as a traitor and most of the de Lacy lands were claimed by the King. He was buried in 1322 after his beheading on a nearby hill near Pontefract Castle after the failed Battle of Boroughbridge where he had led a rebellion against Edward II his first cousin. Alice de Lacy his wife eventually remarried twice but was already dispossessed of the de Lacy fiefdoms that had reverted (escheat) to the crown after the beheading of Thomas Plantagenet. His remains are at Pontefract. Note: Edward the 2nd was the first Prince of Whales and successor to Edward the 1st sometimes known as “long-shanks” for his great height. He was the notorious “hammer of the Scots” and arch foe of William Wallace, ake. “Brave heart”. Wallace was eventually executed by Edward 1st. by being “drawn and quartered” which was a torturous cruel death. 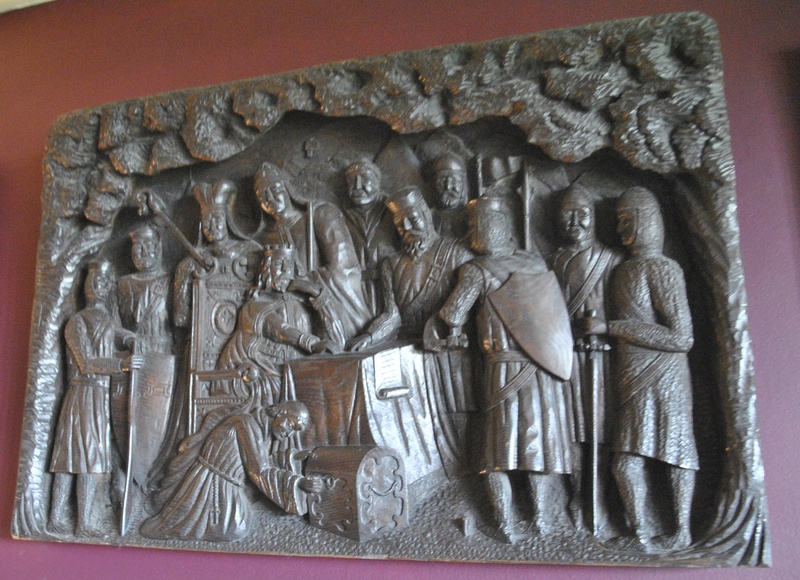 Robert the Bruce avenged his death with the defeat of Edward ll in 1313 at Bannockburg. Alice de Lacy (25 December 1281, Denbigh Castle – 2 October 1348, Barlings Abbey) married Thomas, 2nd Earl of Lancaster on 28 October 1294. She and Thomas were divorced about 1318, because she was convicted of adultery with the Earl of Surrey’s squire, Sir Ebulo Lestrange, Lord Strange, a Shropshire Baron, after being abducted 1317 at the instance of John de Warenne, 7th Earl of Surrey. Her husband continued to hold the title of Earl of Lincoln, having been left the right to bear it in the Will of the previous Earl of Lincoln, her father. He kept his divorced wife Alice in custody in Lancaster. However, upon the execution of the Earl of Lancaster, the Earl of Surrey seized the Countess from Lancaster – much to her delight – to prevent her title being claimed by her brother-in-law, Henry of Lancaster.. She then married Sir Ebulo Lestrange before 10 November 1324, although she was considered too old to bear children. She married Hugh de Freyne, Baron Freyne, before 23 March 1336, and died childless in 1348, her titles becoming extinct upon her death.